The ATAA Remote Chapter Online been established for the benefit of any ATAA members who are too far from an existing ATAA Chapter. Now you won't need to miss out on the benefits of chapter meetings, where some quality networking takes place. Schedule an occasional face-face meeting if attendance warrants it. First preference for attendance will be given to regional and overseas members, if numbers permit any financial ATAA member will be welcome. It is envisaged that meetings will be held on a monthly cycle. Meetings will be recorded and will be available to members on the website. If you wish to attend a "Remote Chapter Online" meeting you must register with us so you can be pre-enrolled in the Webinar software. Send your details via email to . Darryl Nagel commenced trading in 1986, using options over Australian stocks. He has traded most instruments including, stocks, cfds, forex, options and futures, both as a trader and as an investor. 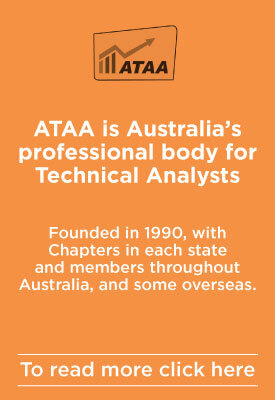 From 2003 to date he has taught technical analysis in Australia and overseas. He has an RG146 for all financial trading instruments. Darryl is a director on the ATAA National Board and a Councillor of the Sydney Chapter. He has been a practising solicitor of the Supreme Court of NSW since 1970. Darryl will discuss this topic from the perspective of both a trader and an investor. Jefferson Arcos was born in Ecuador and moved to Australia in 1995 with his family to Cairns, North Queensland. He started to learn trading with the Share Market College in Brisbane. After one year, he quit his job to dedicate full time trading of the Australia Stock Market, trading CFD’s. He continued his education on the Forex Exchange Markets. Because of his success he became a mentor by having daily webinars in which he placed his live trades according the system that he had developed. Additionally, he has worked for many institutions as well as brokers. He has simplified his trading rules so that traders may trade markets the way he does. Bruce has been a full-time trader on his own account since 2010. Bruce has been trading Rules Based Trading Systems since 2003, and today devotes a significant portion of his working time into designing and the ongoing development of Rules Based Trading Systems. In this presentation we will look at how Heikin-Ashi candlesticks are constructed, and why they offer a very different approach to normal Candlesticks, towards making your trading decisions? Darryl Nagel started trading the markets in 1986, then focussing on trading exchange traded options on Australian stocks. He has taught technical analysis since 2003 and has gained an RG146 qualification for trading all instruments and has been an Authorised Representative under an AFSL. He maintains an interest in learning new technical analysis techniques and has been attracted to the interest in trading Bitcoin and other cryptocurrencies. Darryl believes that a trader will be potentially profitable in trading such currencies using technical analysis. Lately he likes to use Ichimoku and price action for his own trading. Jonathan Smadja is a French analyst and member of the French association of technical analysts (AFATE - Association Francaise des Analystes Techniques). He works as a consultant for companies and as a coach and mentor. Currently, Jonathan is providing all technical analysis on forex and indices for the French branch of CMC Markets. He is also in charge of the monthly webinar offered by CMC Markets to its French clients.Furthermore, Jonathan works as a consultant for AuCoffre.com, the largest European on-line company for gold trading, and is a columnist for the French versions of investing.com and 24gold.com. As an author, Jonathan has released an extensive course on technical analysis which includes more than 1100 pages and 600 minutes of video. Until he left France six months ago, with his Aussie wife and four children, he used to present a weekly analysis segment on TV Finance, a WebTV channel dedicated to finance professionals and traders. Finally, Jonathan has developed a game to learn chartism. It is called “TRADING Millionaire” and can be downloaded for free from the App Store and Google Play. Presentation by Justine Pollard; Adventures of a Trader. Presentation by Alan Clement: Trading System Design: A Practical Guide. Presentation: Putting a Trading Plan Together - Price events to generate %R return against %risk. Presenter : Gary Burton. Please note that the recording of the presentation has not been posted owing to an audio corruption. A patch will be applied as soon as possible to enable the complete video and audio recording to be posted. Thank you for your patience. Presentation by Grant Abbott, SMSF Q & A. Presentation by Alan Oliver: “Gann Time Factors”. We would like to thank all members who participated in our October presentation on Tue, 24 Oct 2017. We trust everyone enjoyed the presentation and you will continue to support the Remote Chapter Online. The recording of the first part of our meeting is available below. Owing to some technical issues the recording of the main presentation is not included in the meeting recording, it is included below as separate links to the same presentation made at the Melbourne Chapter in August. Presentation by Alan Clement, ATAA Director: “What I've Learned From 15 Years in the Trading Business”.